Stems: Erect or ascending, simple or sparsely branched, finely ridged, sparsely to moderately rough-hairy, often covered with resinous dots. Leaves: Alternate, simple, long-stalked; stalks 4/5 to 5+ inches long; blades triangular or broadly egg-shaped to circular or kidney-shaped, 1.4 to 7.2 inches long, .8 to 6 inches wide; surfaces rough-hairy, palmately veined; margins coarsely-toothed and un-lobed or with 3 or 5 shallow lobes; tip rounded or broadly pointed; base shallowly to deeply heart-shaped. Inflorescences: Heads, small, in clusters in leaf axils; staminate and pistillate heads borne separately on same plant; staminate heads in clusters terminal or in upper leaf axils; pistillate heads borne singly or in clusters of 2-4 in middle and lower leaf axils. Flowers: Inconspicuous; staminate disk florets 20-60; corollas minute, tubular, 5-lobed, 1/25 to 1/12 inch long, white to cream-colored; stamens 5, filaments united, anthers free; rays absent; florets surrounded by 1-3 series of bracts; pistillate heads 2-flowered, florets lacking corolla, enclosed in prickly bur with 2 chambers. The pistillate flowers have 1 style and 2 stigma branches that extend beyond the surface of the bur for a short time at pollination, catching the wind-borne pollen. 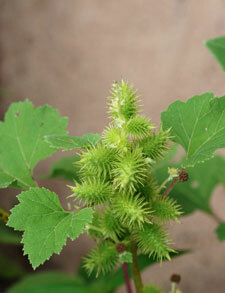 Fruits: Achenes, 2, solitary in chambers of bur; bur cylindric or egg-shaped to nearly round, .5 to 1.25 inch long, covered with stiff, hooked prickles, terminated by 2 prominent, incurved beaks; pappus absent; seeds elliptic to oblong, 1/25 to 1/16 inch long, flattened, dark brown, tip gradually pointed. Habitat: Waste places, disturbed moist areas, fallow fields, sandy flood plains and shorelines, stream and river banks, margins of ponds and lakes; sandy and alkaline soils. Reproduction: By seeds; 1 seed from each bur germinates the first year and the other the following year. Toxicity: The cotyledons are highly toxic when consumed. Pigs and calves are particularly susceptible. Symptoms of poisoning include depression, weakness, loss of appetite, vomiting, and seizures. The seeds are also toxic. Uses: Native Americans boiled the seeds and took the liquid for bladder ailments; boiled the roots to take for fevers; rubbed the burs on sore gums; made a poultice of ground seed powder used to treat saddle sores; rubbed the leaves in the armpit to reduce perspiration; used the ground seed powder to make a bluish ceremonial pint; and ground the seeds and mixed with cornmeal when making bread. Comments: Cocklebur is a highly variable species. It is often observed in sites where water has receded, exposing previously submerged soil. Greek xanthos, "yellow", probably because pale yellow, tan and purple dyes have been obtained from the plant. The burs can cause injuries to livestock mouths, block throat and intestines, and reduce the value of wool. They are sometimes called "porcupine eggs".